Sir Donald Bradman will go down as the greatest cricket player the game has ever produced. This bat display is personally signed by the man himself, Sir Donald Bradman. This ultimate collectable embraces the man, the career and the life of an Australian icon. This Full Size bat carries the personal hand signature of Sir Donald Bradman. 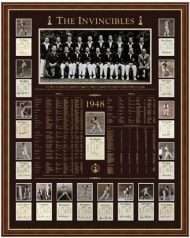 The signature is endorsed by the Bradman Museum and has been protected on the face of the bat with a perspex covering as per Bradman Museum guidelines.